“I absolutely loved this book! I could not put it down. . .The Thief Prince will whisk you away into a new world that you will not want to leave! I hope that Ms. Alsop has more about this story to write, because I would love more Kit and Andric! This is one of my favorite books so far this year! Five stars!” Crystal, Books Are Sanity- Book Blogger“. . . Once I started I couldn't put it down. The story is amazing. The plot is new and the action never stops. The characters are believeable and the emotions presented are beautiful and real. If anyone wants a good, clean, fun, romantic read. Look no further. I hope there will be more books set in Denbria, or better yet Antor.” SH writer- Amazon Reviewer“For anyone who likes tales of princes, princesses with some supernatural elements to it, you will want to read this.” Karen- Amazon Reviewer“This remarkable story causes the reader to never want to put the book down...as if you never want to leave this world. Her ability to describe the characters makes you feel like you've known these characters all your life. You feel what they feel, even their pain. I have read many of her books. Thief Prince continues to be one of my favorites. I've already read it three times. Read all her books...you'll never regret it.” Michael- Amazon Reviewer“I absolutely loved this book! I could not put it down! Anything with a prince and princess is usually a winner for me, but this book is even better! It has multiple princes and princesses on scene over the course of the book! I was completely drawn into Kit's world as she was faced with danger and new circumstances... Kit was a strong character, not a weak and simpering girl who couldn't do anything for herself. The Thief Prince (Andric) was a great character as well! I kept seeing glimpses of who he really was and I loved that the author gave us clues as to what he like under the surface. The Thief Prince will whisk you away into a new world that you will not want to leave!” Bookworm- Book Reviewer“I thought this would be an ordinary medieval book, but it turned out to be full of twists I didn't see. The Princess was very believable in the way she reacted to everything. I liked that she was a true but flawed heroine, and that we were able to start seeing in Andric the things she was hoping would be there. His story was heartbreaking but inspiring; he is definitely one of my very favorite characters of all time. If you like sword fighting, communicating with animals, Romeo and Juliet type love stories, danger, or bravery in spite of the odds, Thief Prince is for you.” Jennifer Ekins- Goodreads ReviewerWhen her brother’s sickness forces Kit to accept the title of heir to her kingdom’s crown, she is outcast by the others and treated as inferior; but when she is forced along with the other heirs on a dangerous journey, her differences turn into strengths that may save their lives. Kit is tested both mentally and physically as she faces odds both on the battlefield and within the royal social circles. 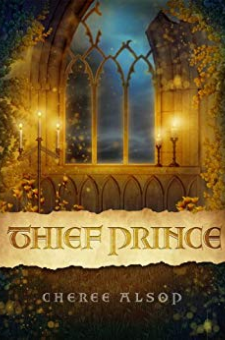 She soon realizes that her greatest challenge may be to return home with her heart in one piece.Thief Prince is a story of courage in the face of fear, and of love despite overwhelming odds. Whether you are looking for an adventure or the chance to see kingdoms beyond your world, Thief Prince is the story to sweep you away.